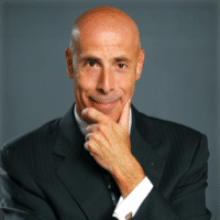 Meet Rob Jolles, the nation’s most sought after speaker on sales-oriented business and founder of Jolles Associates. As a 25 year veteran of developing sales training programs writing three bestseller books on customer-driven sales, Jolles uses his knowledge and experience to education business on the best sales practice solutions. On March 23, he will present his insight as part of The Institute for Excellence in Sales & Business Development (IES&BD) program titled “The Art of Urgency – Moving your Prospects Past their Fear of Change.” Held at the USA Today Building in McLean, the Institute holds monthly programs and an annual award event for sales executives, professionals and leaders, and professional services rainmakers who strive to sell more. Find more information about the program and registration here. Jolles gave WashingtonExec readers tips on maximizing sales in the business. WashingtonExec: What should a CEO expect from his/her sales executives? Jolles: A desire to want to be the best. Too often we tend to look for what some would call a “natural salesperson.” Finding a natural salesperson is rare, and there is still no guarantee they will work out in an organization. What a CEO should expect is a willingness to work hard, a hunger to want to be the best and a thirst for any edge that can make them better. WashingtonExec: What is the biggest sales mistake that most of your clients make frequently? Jolles: One of the biggest mistakes I see my clients make is not committing to the sales processes they are trying to implement. This usually comes from the lack of a clear implementation strategy once the sales force has been trained. WashingtonExec: What do you suggest they do to change? Jolles: First, we need to stop confusing product training with sales training. If we tell a salesperson they are being sales trained, and push product training at them instead, we certainly can’t expect tactics as simple as asking questions and listening to be instinctive. Second, we need to stop thinking that sales training is a one-shot experience. To create a true cultural change we need to be reminded that tactics being taught are not optional, but rather a part of the culture of the organization. Finally, we need to demand a clear-cut, defined implementation plan for any sales training that is conducted. That means laying out a responsible path for both the organization to follow, and the vendor who is participating in the instruction of the sales force. WashingtonExec: What role do you think the CEO should play in the sales operations of the firm? Jolles: I have always believed that training should be conducted from the top down, so one of the most important roles a CEO can play is to inspire the sales force by going through the exact same training they are going through. This sends the correct message to the sales force and allows the CEO to truly empathize with the plight of the sales force. WashingtonExec: If you had one tip for a new sales person, what would it be? Jolles: Remember, the more the client talks, the more they like you. Ask questions and listen, and understand you create trust not through your demonstrated knowledge of the solution, but through your demonstrated knowledge of the client. WashingtonExec: What should sales people expect to learn from your program? Jolles: It’s a 90-minute program, but I’m a pretty competitive guy. Attendees will learn what role their personal style plays in selling, along with a Decision Cycle their clients go through when making a decision for change. We’ll go over repeatable, predictable, and measurable tactics designed to create trust and urgency in their client’s mind. What’s more, they’ll learn tactics to increase their ability to implement what they learn, along with a detailed and documented handout providing speaker’s notes, and Mental Agility® exercises so what is learned can be applied. Amy Miller Feehery Joins Hitachi Data Systems Federal, Inc.